DARMSTADT, Germany — The four homeschooled children of a couple in Germany have been returned to their parents upon the condition that they attend public school as per German law. The Wunderlich family had been aware, however, that German officials were seeking to take away their children. Last year, the government was granted legal custody of the youth, but the matter was stalled in court. In the meantime, reports state, officials took their passports so that the family could not leave the country. Dirk said that one of the most horrific and heartbreaking aspects of the seizure on was when his wife tried to say goodbye to their 14-year-old daughter Machsejah. On Thursday, following a court hearing about the matter, the Wunderlich children were returned to their parents after Dirk and Petra agreed to send them to a state school. 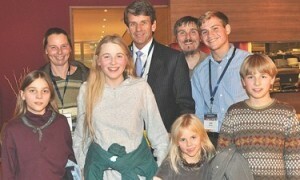 However, Farris said that there is much work left to be done in the fight for the right to homeschool in Germany.